This is an evergreen shrub with a divine scent at night. 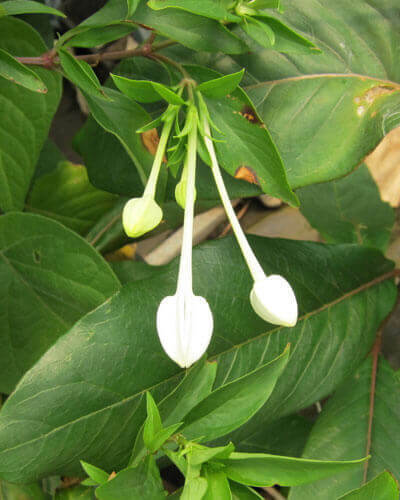 The flowers open in the evening and the scent is very sophisticated and elegant. We cut some flowers off and put them in a vase in the bedroom. I can't tell you how beautiful it is to come to bed when the room is naturally scented with Bouvardia. Also wonderful when planted outside under the eves near a window that opens, or somewhere protected from frost where it can be appreciated when sitting in or near the garden. Cut back after flowering for a second flush in autumn. Ideal for pots. Height 1.2m. Width 50cm. Full sun to part shade. Protect from frosts.